Mother of Commodus, Lucilla, Annius Verus and Aurelius Antoninus. 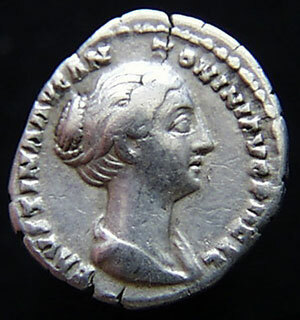 Faustina the Younger was the daughter of Antoninus Pius and Faustina the Elder. She became wife of Marcus Aurelius and bore him fourteen children, of whom the only surviving boy was the future emperor Commodus. She followed her husband from one military camp to another and earned the nickname �Mother of the Camps.� She died in 175 in a village in Cappadocia, now eastern Turkey, which was renamed in her honor. Rumors run wildly about her alleged infidelity but there appears to have been little substance in them. She was much loved and respected by her husband, who had her deified just like her mother, even though the Senate hesitated, on account of the adultery rumors. List all Faustina Junior coins in the Catalog.